A month or two ago, a Twitter friend retweeted @berniebay saying Funny how the contemporary webmaster is really a marketing person… I retweeted that, adding At least, if they’re good ones. But—my poor grammar aside—my reply has been bugging me ever since, though I was unable to pinpoint why. I finally figured it out: I was wrong. A bad webmaster is still a marketing person, just a bad one. One that markets you poorly. @berniebay was right on the money. Read on as I examine why he’s right, and why that should influence who you hire to do your Web projects. A Web presence is no longer optional for most businesses. Additionally, the page your husband’s co-worker’s nephew hacked together for you in 2000 is not sufficient. Neither is the Geocities-era (R.I.P.) or Homestead-built, ugly, unnavigable site of days past. It’s no longer adequate to simply have a Web site; we’ve moved beyond that as a society. To grow your business, your site needs to look professional and be one step ahead of the marking efforts of your competitors. That means having content that is easy to find, easy to read, and pertinent to both the customers you have and the ones you want to attract, all wrapped in a pleasing design. The first step in working toward that is hiring a person or firm to relaunch your Web site for the modern Web. Before you sign on the dotted line (the right person to hire will have a contract for you both to sign—both for your protection and theirs), ask your future webmaster “how will the work you do for me market my business?” Go ahead, ask. You might throw them off for a second, but they should be able to answer that question without problem—if they’re good. If they’re bad, the following are just a few of the things they might do that will hurt your Web site in the long run. Your homepage is no longer the entry point of your Web site. When a visitor comes to your site from a search engine, he or she could end up on any page in the site. If you expect the visitor to explore other pages, they need to know where they are in the site and have a way to get to other locations. Menus should be well-organized but not overwhelming. A bad webmaster doesn’t care about this information architecture. Information architecture refers to the structure or content in terms of intra-site linking, menu structure, folder structure, and content organization. A bad webmaster will not have a consistent linking scheme, will not provide any visual or contextual clues as to a visitors location in the site, will have outdated menus that link to broken pages, and a variety of other things that make your vistor’s experience bad. I’ve even seen cases where poorly developed sites will have two or more versions of an important page that are linked from various other pages. There are a couple reasons why this is bad. The first has to do with maintenance: a simple change to that content has to be made in multiple locations. That takes time, and introduces a greater possibility of errors. The second has to do with duplicate content. Search engines do not like finding duplicate content on Web sites. In the long run, this can mean a reduced ranking for your entire site, which means less exposure and less traffic. When a page is moved or renamed, even a bad webmaster will hopefully change the links to it on your own Web site. But links to that content may exist in other places on the Web as well, which means users will see an error when they reach your site. A bad webmaster doesn’t care, or doesn’t know how to get around that, but a good webmaster will set up redirects for those pages. Redirects are a way of telling the server that the old page still exists, and forwards the visitor or search engine crawler to the correct new location. Setting up redirects is of the utmost importance whenever a site is reorganized. Especially if you have someone creating a new Web site for you, you’ll want them to redirect all of the old URLs to the corresponding new ones so that anyone coming through a search engine, bookmark, or link from another site will still be able to find the information they were looking for. Sometimes, a user will end up looking for a page that does not exist on your Web site. Either it was removed on purpose or the URL was typed incorrectly in the address bar or in a link on another site. A bad webmaster thinks that the server’s basic 404 error page is sufficient. But in reality, that page is utterly worthless to your marketing efforts. Chances are that the visitor will see that, go back to their search and not give your Web site another glance. A good webmaster will set up custom error pages for your site. These pages will have your branding, and will have helpful links for a visitor. These custom pages commonly have links to the site map, or a search functionality so that users can try to find what they were looking for on your site. These pages may entice users to stay on your site rather than going away quickly. I recently worked on some changes to an old site where every file was named some permutation of “pageXX.html.” This is absolutely terrible structure. It’s bad for the webmaster because who knows if the About page is page2.html or page5.html, allowing for a higher change of errors and broken links in their code. It is bad for the visitor, because it not only creates confusion as to what page they’re looking at, but it also shows that you have a lazy webmaster. Pages should always have relevant filenames. Naming your about page “about-us.html” has much more semantic meaning to all parties—the webmaster, the visitor and the search engine. This idea also extends to dynamic content. You’ll often see something like “/products/prod_type=23532&id=234982342.” That has no meaning to the visitor. Instead, a good webmaster will set up the server so that the URL is more like “/products/doodads/whatchamacallits.html.” This way, visitors know what they’re looking at, and can easily move back to an index page of all doodads, or back up to the Products page. While having a page on the site called a site map that lets your visitor quickly see the structure of the site is useful, in this case I’m talking about a different type of site map: one generated based on a standard adopted by the major search engines. This file, usually named sitemap.xml is a very important addition to your site, even if your visitors never actually see it. It essentially lists every single page in your site and lets the search engine know how often (approximately) that page is modified and how important it is compared to other pages on your Web site. A bad webmaster may not bother generating this file, but a good one will both generate it and submit it to the major search engines, which increases the likelihood of your Web site being crawled and fully indexed on a regular basis. You may have noticed a theme here. The above list is composed mainly of approaches that affect your Web site’s ability to be found in search engines. It’s great if you get traffic from people who know your Web address, but there’s no way to grow your business if that is the only traffic you receive. In that paradigm, if you want to grow, you have to find a way to inform people of your Web address, which may mean spending money in traditional media. That’s wasted money—and more money on top of the cost of your Web presence. Why would you pay extra money to do your webmaster’s job? If your Web site is done right and managed properly, traffic will come to you because people will find your Web site when they search for keywords relevant to your site. This traffic is how you grow your business in 2010. Webmasters, do you have anything to add? 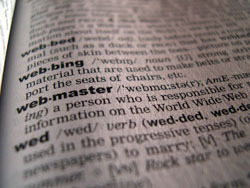 Clients, what do you look for in a webmaster? Absolutely amazing as usual. A tip for your readers: use a different page for each of the keywords groups that you want to be found for. Keep each page as specific in topic as possible.